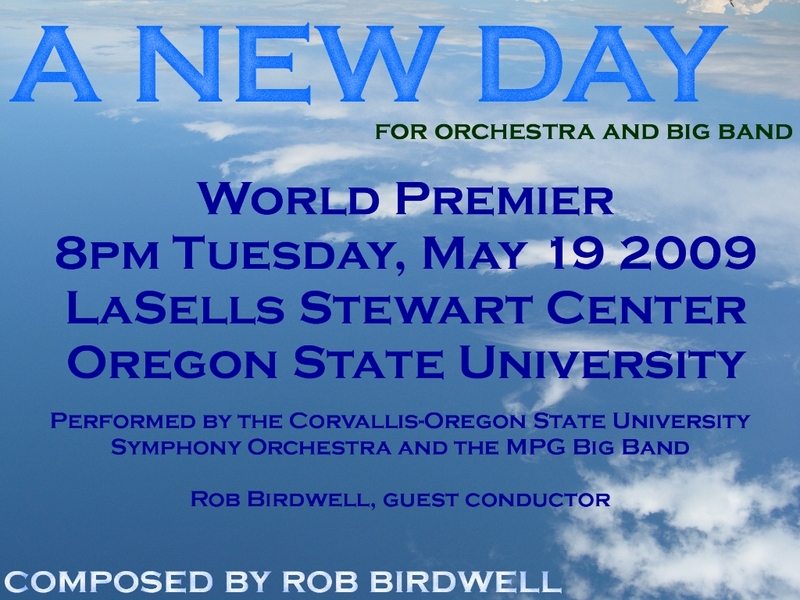 Needless to say, I'm more than a little excited about the symphonic/big band debut of A New Day, which will take place Tuesday, May 19, 2009. The evening's music will begin at 8pm at LaSells Stewart Center, Oregon State University. Click here for ticket information. The orchestra sounds fantastic and we're all looking forward to welcoming the MPG Big Band from Germany and putting it all together. This concert is sure to be a very special night of music - the program will feature a wide and wonderful variety: music by Strauss, Beethoven with additional world premiers by Coolen, Hu Xiao, and Dauner. I composed A New Day especially for the Corvallis-Oregon State University Symphony Orchestra and the Max Planck Gymnasium Big Band.